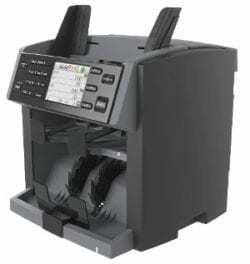 X-1000 is designed for large volume cash processing up to 72,000 bills per hour error-free while optimizing cash processing efficiency at financial, casinos and super-markets. 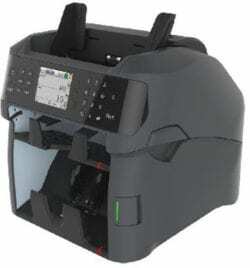 Featuring sophisticated Dual-Sensors image processing technology, it provides various counting and sorting mode of operation uninterrupted with a dedicated full reject pocket while at the same time, provides superb suspect detection. Since it’s released in 2014, X-1000 gained popularity for it’s low bill jam rate, heady-duty performance, precise and accurate authentication. When we say heavy-duty performance, it means X-1000 is able to handle as many as 18 million pieces of banknote counting a year with service maintenance plan in placed and proven uses in various casinos around in the United States. X-1000 also provides users with superior operating experience and simplicity which is important for all bank tellers, casino operators and retail back-office uses. While X-1000 includes most sophisticated user-friendly operating interface with various modes of operation for non-interrupted functionality, it also includes some important features that stands out among many of our close competitors in the market place. Some competitors inaccurately and deliberately compare AMROTEC® X-1000 heavy-duty grade machine with their lighter-duty compact machine (copy and paste this link on your browser https://drive.google.com/open?id=1Cv3KOu6L-r3cyAtG31YsI5E_1hGtohrl ) to see a comparison made by one of the competitor which is inaccurate and misleading at it’s best. Reduction of overall components to make machine compact and light-duty: Some competitors inaccurately claim that fewer parts in a machine means there’s a less of a chance that something will go wrong and proud themselves for eliminating as to how many roller shafts they reduced, and how shorter their bill path is as well as uses of composite materials (in another word, plastic) instead of metal components in the bill path to reduce friction and size of the machine. They ignore the fact that heavy-duty machine like X-1000 in which users are putting up as much as 18 million of pieces of banknotes counting a year, durability of parts and efficiency are more of a concern. X-1000 uses of shortest bill path of 405mm among many comparable heavy-duty machines and with corresponding 17 roller-shaft, brake and Clutch in combination allow smooth bill feeding and error-free bill transport to stacker or diversion to reject pocket neatly & in organized manner. Fewer the parts, chances of over- uses and extreme pressure on each of the parts when comes to heavy-duty use like X-1000 is designed for and used for; without such durable construction, it will lead to higher trouble-calls and increase service frequency. Metal still has it’s non-replaceable position in heavy-duty equipment manufacturing as to-date. With technology today, metal components along with composite materials in combination as X-1000 designed with, resulted in higher durability in the long-run. Such trends can be seen in the mobile phone industry as such all high-end models are using metal components in alone or with combination of composite material instead of simply plastic. Bill transport path aspect: Banknote is one of the most difficult documents for transporting towards it’s path to stacker and divert to reject pocket since banknotes are comprises of various quality and conditions. Further it tends to create more operational disturbance. Shorter bill path does not mean system can process banknotes in higher speed as high as 1200 bills per minute or 72,000 bills an hour like AMROTEC® X-1000, sometimes even creating havoc and nightmare for service professional to service those light-duty machines placed in heavy uses location. 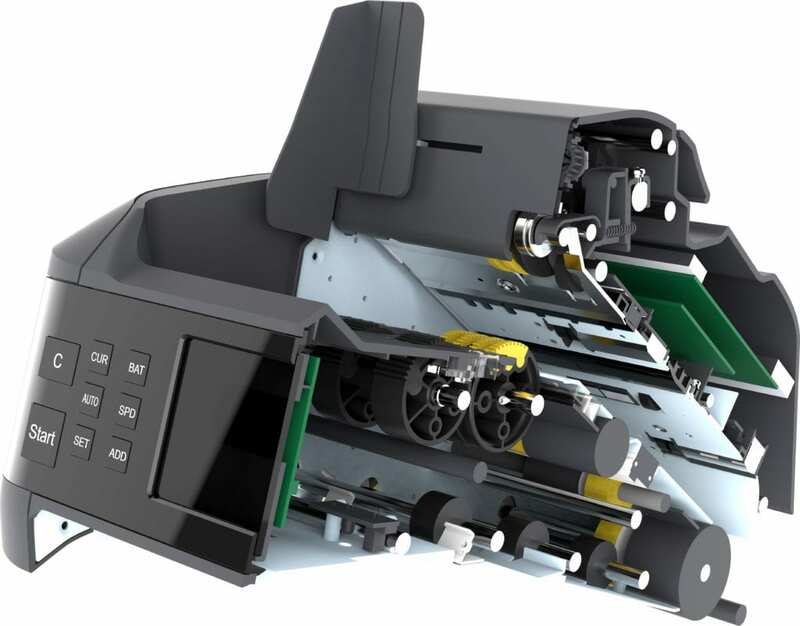 A Smart-Choice: Our X-1000 is equipped with precise transport path and necessary rollers and shafts to process banknotes at a fastest rate, with highest accuracy in bill recognition and suspect detection, therefore, each and every materials were chosen to construct our X-1000 for long lasting and stable performance. Since 2003, AMROTEC® has been offering most innovative, up-to-date and User-friendly Cash and Coin Processing equipment solution to count, sort and authenticate currencies and coins. Equipment you can count on!